A trainer attempts to clarify the workings of a business that has a ‘bad reputation’. 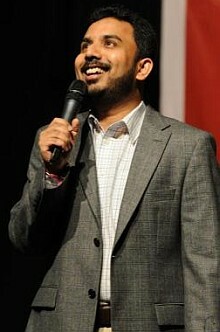 PATHMAN Senathirajah stumbled upon network marketing when he was just 18. Fresh out of law school, he’d just started work at a law firm in Kuala Lumpur. Senathirajah has always dreamt of being rich and successful and he knew that he wouldn’t achieve that – well, not at lightning speed – with a regular nine-to-five desk job. So, when he was presented with a business opportunity in network marketing, he decided to give it a go. That was some 20 years ago. Presently, the 37-year-old is a trainer and managing director of V Global, a training, network marketing and development company that has its headquarters in KL but has offices in Canada, the Philippines and India. 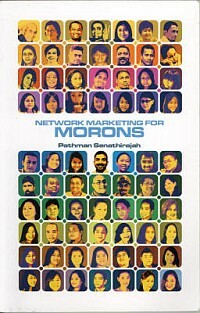 Pathman Senathirajah’s book is for anyone who wants to understand what network marketing involves. Senathirajah (right) reckons that he has achieved his dream of being a successful entrepreneur. His business has operations all over the world, from Indonesia to India to the Philippines, and he travels regularly to these markets to train his network marketers. He was recently named “trainer of the year” by Obtainer, an online business and lifestyle magazine. Then last year, he decided he’d write a book about the industry, which he says has been “misunderstood”. “I was very young when I got into network marketing. I was just 18 and wanted to make money. When I first started out, I realised people had very strong impressions about the industry. Some called me a door-to-door salesman and others just called me a moron for doing it … And then there were some others who saw me as an entrepreneur. “At the time, I didn’t fully understand the business myself. So I did a lot of research and soon realised what a huge industry this is, particularly in the west. In the United States and Europe, network marketing is huge. Last year alone, the industry recorded a US$130bil (RM399bil) turnover and many of these companies are public listed. It’s a big business. “However, here in Malaysia I constantly encounter people who have an issue with network marketing. It doesn’t have a very positive reputation. People, often professionals, often say, ‘ How can I do this? I can’t go around selling products.’ There is so little knowledge about what it really is and I wanted to do something about it,” explains Senathirajah, who hails from Teluk Intan, Perak. His book, Network Marketing For Morons, defines the nature of network marketing and the role of marketers in the growing industry. “I wanted to write a book that can be picked up by anyone – a housewife, an accountant, an engineer – to come to some understanding about what the industry is about. It’s not a training manual for network marketers,” he says. In the book, he addresses the many misconceptions about the industry and goes on to explain what it is actually about and how it works. “The first misconception is that it is something for housewives and jobless people to get involved with. Or, the last alternative to make money. It is perceived as a business for desperate people and isn’t seen as serious. “But network marketing is being recognised as a legitimate business and each day, many professionals are getting involved in it. Why? Well, this is the bottom line: a business is something that allows you to make a profit. It’s not easy to be successful in business whether you are in KL or New York. It’s high-capital and you need a certain skill set to succeed. “With network marketing, you don’t need a qualification, or a lot of capital, or a specific skill set. Most network marketing companies have very systematic training systems to train anyone to become an entrepreneur. And it works … we have net-workers who walk out the door with some serious income. .... we’re talking about people who make US$40,000 (RM122,730) a week, or US$1mil (RM3.06mil) a year. Of course there are also people who make US$200 (RM613) a month but that just depends on how hard you want to work,” he says. “Network marketing companies retail anything from cosmetics to condominiums. Now every company, whether it is Nike or McDonalds, needs to promote its products. Most do this by way of advertising or appointing brand ambassadors. Billions of dollars are spent on advertising campaigns. He also addresses the many doubts people have about the industry, such as whether or not network marketing is a legal business, and the difference between network marketing and a pyramid scheme. “Network marketing is not a get-rich-quick scheme or a get-rich-free scheme. You can’t sit at home and let your business grow. It has taken me years of hard work to develop the financial freedom that I longed for as a young boy. “But the beauty of it is, the hard work is talking to people. If you can talk to people and not feel demotivated by those who reject what you have to say – which will happen many times – you can succeed. “I just want people to read the book and then come up with their own conclusions about the industry. They don’t have to like it or believe in it. But at least they know what it is about,” Senathirajah adds. > Network Marketing For Morons is published by Rythm House Publishing and is available in major bookstores.